VEKSAR: Shortly after the Shissar were run out of Kunark, a resort by the name of Veksar was built by the Kylong Iksar Tribe. 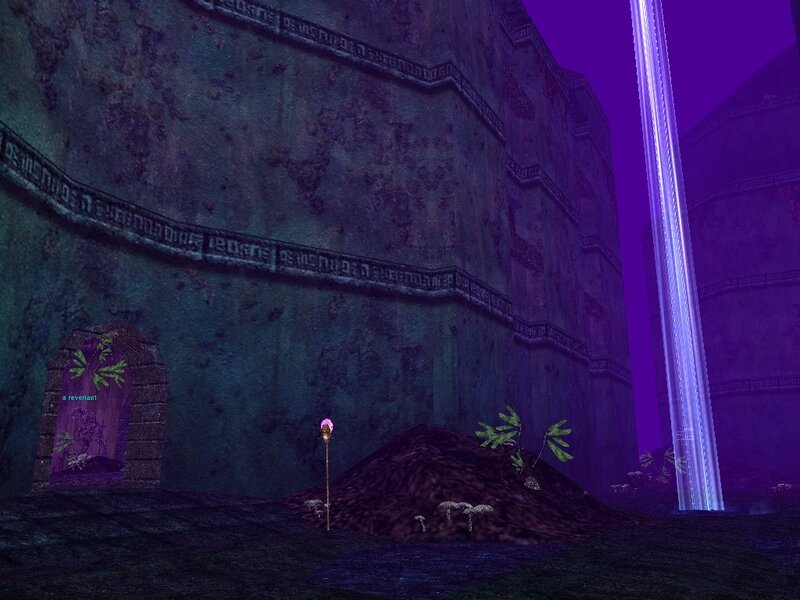 Veksar was destroyed by the dragon Garudon, and sunk to the bottom of what is now known as the Lake of Ill Omen. 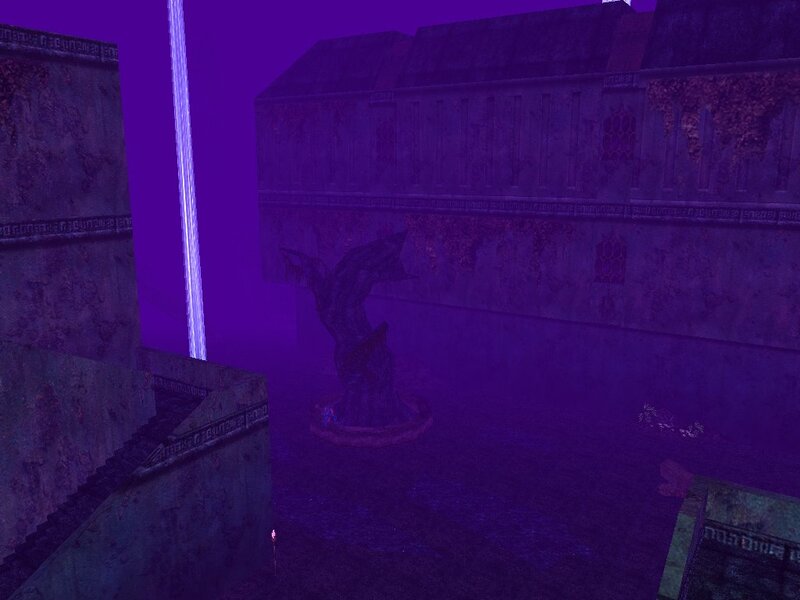 Now beneath the surface of the lake, Veksar is inhabited by sealife and the spirits of those killed in the incident. It is said that the spirit of the dragon Garudon also resides somewhere in the ruins. 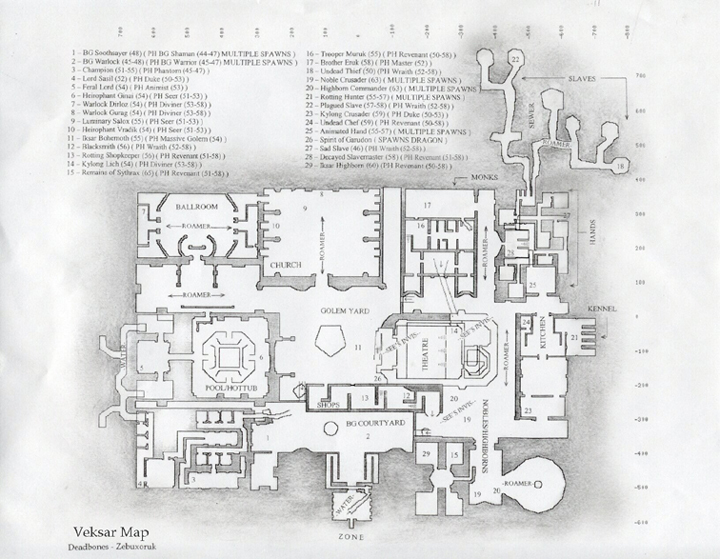 Only few adventurers who have chosen to trespass in to Veksar's confines have been able to return to tell about it. Tough mobs for their level. I really enjoyed this zone first time around, but I was likely lvl 65 then in ele/time gear, I've found it much harder going this time on Phinny. At lvl44 (trio of warrior/sham/mage) the bloodgills inside are yellow cons, they don't hit particularly hard and can be slowed, but they have a load of health. The lv45/46 warriors were at around 6500hps, the shaman around 5500. Named mobs in CoM (Dread Wraith/Way Bones/Golem) are red cons at 44 and all have under 6000hps. Its almost like trying to xp on named mobs. As has been mentioned though the shaman gate and that really ruined my day. After killing a few one got away and brought the rest of the zone. I managed to zone my trio out even though its an underwater swim with 3 chars only to die outside as designers chose to put mobs outside as well close enough to the zone to aggro. I didn't really want to level up in Velketors again, but Veksar doesn't look to be the kind of zone you can XP in efficiently until you are a few levels higher than the inhabitants. Veksar was released with LDoN on phinny because of the level of NPC's in the zone. A large majority of the mobs are mid 50's to low 60's. What expansion does this zone come in? It came out a few months after LoY was released. Great experience for the levels of the zone, great loot, interesting and fun layout of zone. All around one of my favorite zones. First time here and I am officially in love with this zone on my 59 cleric. Ended up pulling half the zone when my invis vs undead wore off...was so classic. Not much has changed here, I came in as a level 46 Bard with a Cleric Merc. I started with the Crusaders and Sentries and leveled twice in a few hours. I stayed with them until I hit 49 and then started moving in a bit. I've been trying to find the grandmasters (got the quest from the HOT Zone guy in POK) but can't find the path to them yet. The up and downs of the place are hard to decipher with the online maps. I'm currently in the theater killing yellow curates and spell binders at 56. I use Selos Chords of Cessation, Selo's assonant Strain, Melody of Ervaj, and the 54 clerity song in a medley. It takes about 3 to 5 minutes to take down each one. With my pocket dwarf the only time I've died is when I got greedy and a red spellbinder added when I was killing a red curate. I have never been summoned while fighting here, but then I'm always beating on them. The biggest problem is the gaters really. The vessels will gate at around 30% or so and will train you with their buddies. 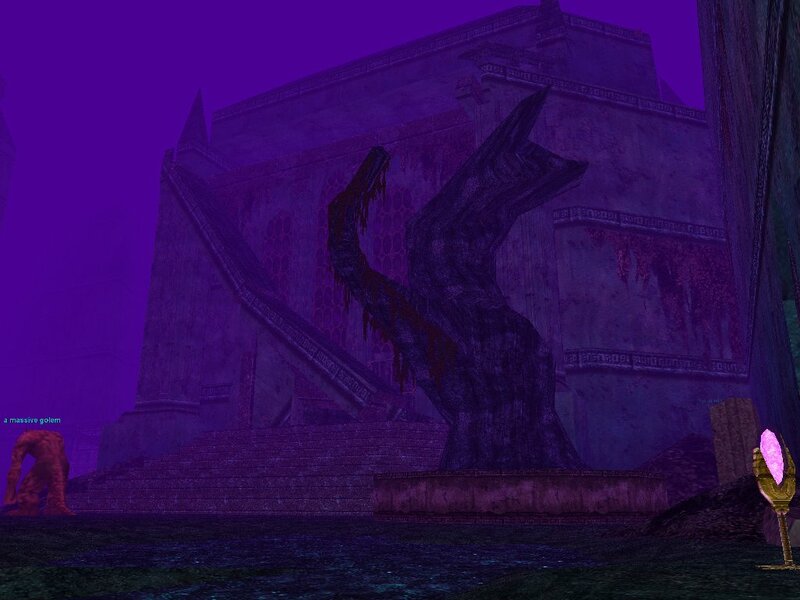 How do you enter Veksar from the Lake of Ill Omen? Are there any underwater landmarks near the entrance? Swim around the base of the platform on the bottom of the lake. Look for a big liz statue. Just killed another one that conned red. Seems they con the same level of the mob they are mimicing. The first one lvl 59 was mimicing a Noble. This one was mimicing a Noble Commander (lvl 63). As of Hot Zone status there's a new mob called a cliknar scout. This mob is revealed during a fight with a normal mob. Conned white to a level 59. You must use the solvent Class X Augmentatino Distiller to remove this augment safely. Once you hit level 69 almost all the mobs or light blue or lower so exp drops a lot. so get your straight running speed buffs before (re)entering Veksar. Any opinion on if a level 56 Pally with average equipment, 24 AA points and a fabled ghoulbane could solo here? Getting really bored with LGuk. Thanks! At 58, with 4520Hp/1400 AC unbuffed and a bunch of aa's, i can solo quite some things here, undeads or not. Entrance gobs are no problem, Crusaders and Sentries neither, Duke start to hurt a bit (hitting in the 150-200's on me, but rootable and doesn't summon). Wraith were doable, but not very efficient xp/time wise. All of this self buffed (Brell Steadfast Aegis + Austerity), no KEI. Would a 65 pally with half way decent gear be able to solo here? Got like 80 some aas and my defensive aas are mostly fleshed out. have run3 so running not a problem, just wondering if it would be soloable as I need a drop from here for my necros imprecation spell. Yep!! When Veksar was hot zone last year (2006) I soloed my 65 Paladin there and aquired 500 AA's in that zone alone.. Always remember to play zones / mobs that your class is best at killing because it equals faster exp.. My paladin is 70 now with 680 AA's and still comes here to farm AA's, Ore's, Pebbles & is only 1 mob in there he can not solo and thats Gaurdon.. Have fun mate and crank out the aa's in here.. Go to highborn area, theater, or back by where brother pops and kill grandmasters and you'll crank out the aa's.. Make sure you get slay undead #3 & then switch to Weapon Affinity till you cap it to 5, then switch back to cap Slay..
why not just run there and check it out for yourself? you'd probably find out faster that way than posting here. To answer my own question...Just barely. Pallys just don't have the HP to survive for an extended stay, unless you like spending long periods of time resting and medding. Doable here for the lower level mobs, but not exciting. Veksar is the best 'free zone' that SOE has ever released. Great XP, loot not bad for a group of 50's and it's hella fun to crawl. I would say Chardok B is better but the loot in Chardok B does not match the group level needed to hunt their so overall, Veksar is the champ. what do you mean by 'free zone' ?? I think the OP meant "free" as in not a part of any paid for expansion. The Warrens was similarly done at the second anniversary. As was Stonebrunt shortly after that. This zone has become an excellent source of Tribute (personal and guild) for me. I solo hunt here a fair bit, and at 68th level and my defensive AAs mostly fleshed out, I find I have little problem dealing with most of the monsters here. The new cleric ward makes things even easier. I typically go in a somewhat elliptical route starting with the Iksar Behemoth, through the shop, drop down and run to the Kylong Crusader/Chef room, run over to Brother Eruk's room and take him out and the trooper upstairs (taking out the slavemaster too if I fancy, en route), hop over the wall and repeat. This is an incredibly easy zone for me to move around; I use Innate Invis to Undead a fair bit here, and it works on all the undead up to highborn level. Anything live, I use pacification on; typically, to get to my camp area, I only need to pacify two goblins and two or three iksar golems, and then I'm pretty much set. The low aggro range and the lack of any wanderers in my combat area make this zone one of the safest. Now, however, the low spawn rate of nameds balances out the relative ease I have in moving around the zone and the general lack of risk from adds and such. If I head to Veksar for a few hours, I can usually count on getting three or four nameds, but in that time I could be clearing out a string of 8 placeholders anywhere from 4 to 12 times, so the return on investment is still quite fair, I'd say. Nameds do seem to be a bit streaky; I can go there, clear all the placeholders three times in a row and never see a named mob, then I can get four in a row and three named respawns one after another. Such is the wonder of the Random Number Generator. I can usually leave with anywhere from 5k to 30k tribute (average); there are some wonderful tribute drops (particularly from Brother Eruk, whose items are decent but people often have better by the time they reach the recommended level). This zone is now indoors, no sow, no mounts, no jboots. Please change it on your zone type posting. This zone is INDOOR, not outdoor. They did change summoning rules. Named summon, PHers do not. Some highborns summon also (commanders at least). Gee Boss, me likes dis tingie you gave mez. Whatz it do zactly dummy? Could a 55 Mage solo here ? Once you reach 52 and get the 600hp heal you can solo here without problems, best thing is to invis past goblins and run up to the sentry's and crusaders. They are very easy to single pull. Most are in their own rooms even. I have been here since 53 and am 62 now, working my way in deeper as I grow in power. This is definately a fun zone. Easy singles is a primary reason for that since mages can't crowd control well. Have fun owning this zone. Door Goblins ( shammies & warriors ) hit in the low 100s and do still argo add my 57 warrior. the sentrys, crusaders ( 611 harmtouch ) in the hall on top of the ramp hit mid/low onehundreds and they do summon, I think it would be a bit difficult to solo as a caster, at that level. That being said...great zone, good exp at 57 and nice drops once you get in alittle. Good hunts and rare drops to you! "I went to Everquest and all I got was this Lousy Kunark Gear"
I was able to solo in Veksar as a necro in my low 50's but I wouldn't expect a mage or most other classes to be capable of it. The bloodgills near the entrance would be your best bet, because they don't summon. As a necro I was able to pull them to the top of the stairs and then fear kite them back down with a low-duration fear. There really isn't room here for a mage to aggro kite, since they don't have a snare, and require line-of-sight to land their nukes. Straight mage pet tanking them may be do-able but probably not very efficient, since they hit pretty hard. A druid, shaman, or wizard could probably do better with root/rot or root/nuke, but some are casters so decent resists would be necessary. The undead, they hit harder and they all summon. So, kiting is not an option, and if a solo mage does steal aggro from his pet, he will be a greasy spot on the floor in a short amount of time. I would recommend you partner up with a necro or shaman to hunt here. Since they can't be kited, the only efficient way to kill the undead is to slow them. Can a 53-56 Shaman Solo in here? I am not looking for huge drops just good xp. I am finding it hard to find good fast solo XP. Eternity: The amount of time spent on the wrong side of the bathroom door. Solo CoM...at about 54 head into the castle and do the 2nd floor. CoM is a "hot zone" and the exp is therefore very nice. Is there an "undead" only area(s)? Looking for somewhere to take a 55 warrior, 56 necro and 65 cleric. The necro will be able to slow, but only on undead mobs. Edit: added area(s) to the first question. A lot of the areas are undead-only. In fact, once you pass the goblins in the entrance and go up the ramp that leads to the rest of the zone, the whole route is undead-only until you get to an open area with golems. The golems, the goblins and I think the hands are the only non-undead in the zone. Try out the building-areas just up the ramp from the goblins first and see how you manage. I can't find a bigger version of this map. I don't know where it is from. This is the only link on the net that actually works !! So named summon or just some of them? Every Undead in here summons, everything, not sure about gobs. I've never seen a Gob summon. They are all below level 50 I believe, even the named, so doubt any of them summon. I hunt with a 65 Beastlord and and a 63 Shaman, my toon is a 58 monk. This sounds like a fun place to run around a bit, but do you need a key or anything to get in? Thanks much will have to check it out tonight! No key needed. Just need to be fast enough swimming to get to the entrance, and get in. First time around, I would encourage you to use a water breathing spell, as it can take a few minutes to find, if you've never gone before. 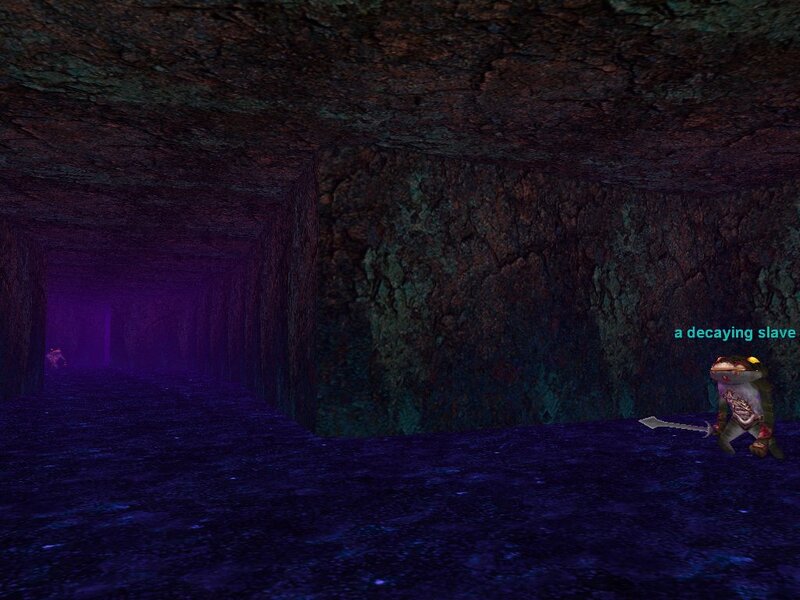 The entrance is at the BOTTOM of lake of ill omen. What named could a 60 Necro solo camp in Veksar? Decent gear and no Tribute. I have read that both camps are near the Chef. (The plauged slave being near the sewer entrance). The only way I know to get there is passing through Shop, jumping off ledge, then invising past the Highborns. I have seen the map linked on this sight and that is helpful to get feel for layout. But I am still fuzzy on knowledge of where the camps actually are. Would appreciate any advice. 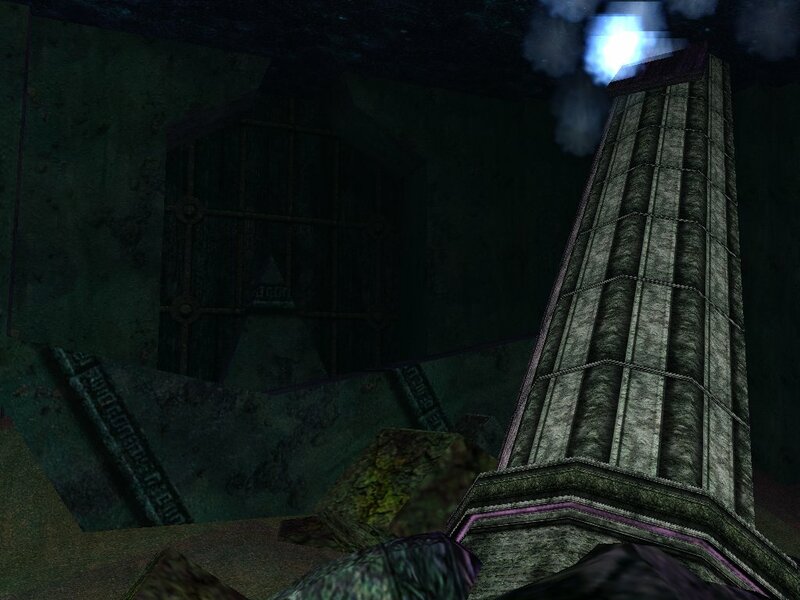 Another way to get to the sewer side of Veks is to go up the ramp behind the Golems.The bottom of the ramp is around neg143, neg70. Be careful at the top as it is filled with Spellbinders. These will see through all Invis, even Invis to Undead. They also see through Rogues Hide & Sneak, also, they cannot be Pacified. Only way past em is to fight it out. Once past the two closest to you at the top follow the hall to the north and then down the steps. At the bottom go south and enter the room to your left, there is a set of steps that lead up and past Curates and more Spellbinders. Keep going up and eventually you will find a ramp that leads down into the other side of Veks. Be Safe, and when that fails, Be Brave! You can kill pretty much whatever you want in here if you have a 65 shaman helping you out. Only thing you would need more for is Garudon. I walk all over the place just as a solo 65 necro. Showing 25 out of 97. Click here for the full list.